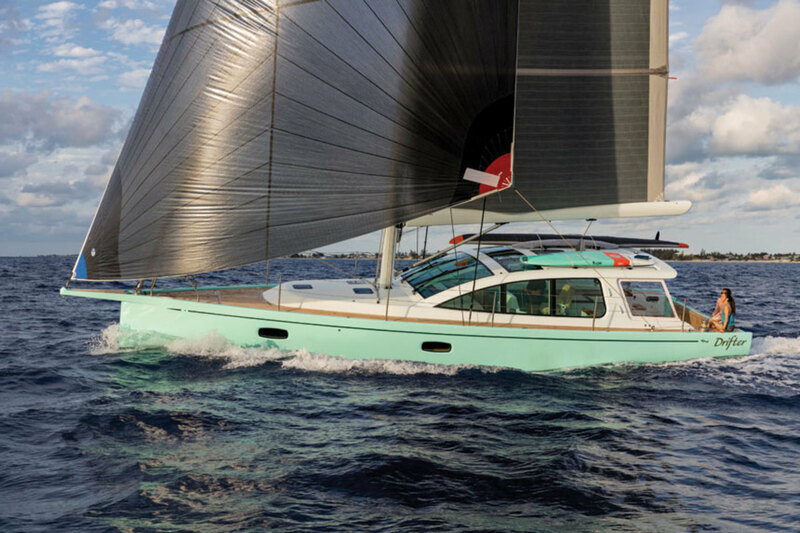 Splashed in May for launch customer Jimmy Buffett, the Surfari 48 is the latest design from naval architect Ted Fontaine. 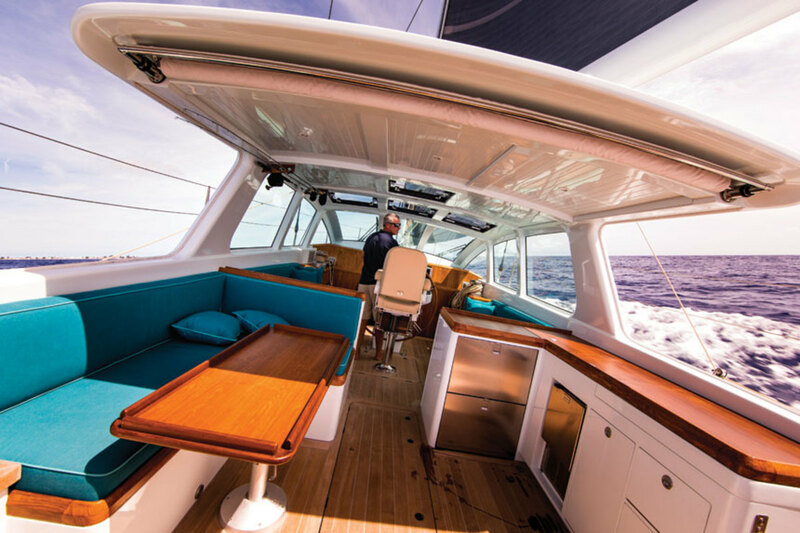 Playful, fast and built with utility in mind, the Surfari 48 aims to deliver comfortable, single-level outdoor living and easy access to on-the-water fun. Fontaine designed the boat to provide spirited performance under both sail and power. A carbon fiber rig supports 1,324 square feet of sail from a boom-furling main and roller-furling jib that operate electrically at the push of a button. Sheeting controls are also electrified, making trimming underway easy. A hydraulically-operated lifting bulb keel has a five-foot, six-inch draft with the keel up, and an eight-foot, six-inch draft with the keel down. 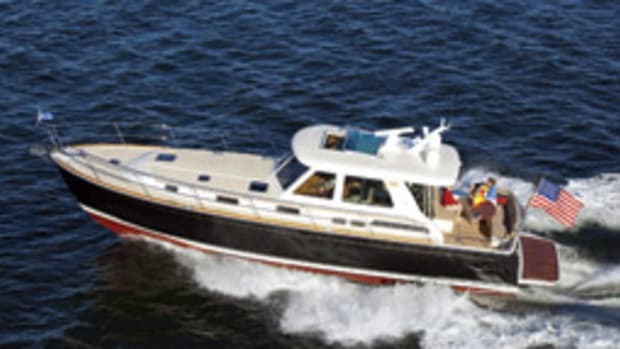 Twin 85-hp Yanmar inboard diesels mated to Sail-Drives with three-bladed props provide a top speed of 10 knots. 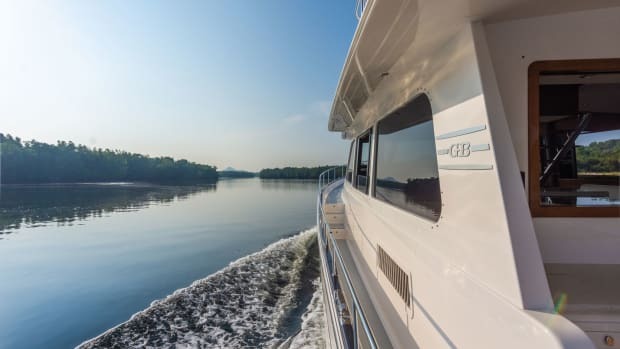 The single-level main deck is protected for much of its length by an integrated hardtop/pilothouse that can be buttoned down in bad weather or opened up when it is pleasant. A binnacle-mounted steering wheel sits far forward under the hardtop and is flanked by two settees. Farther aft is an outdoor galley with pull-out refrigeration, an icemaker, a sink with a freshwater mixer and an electric grill. An L-shaped dinette with teak table sits across from the galley. 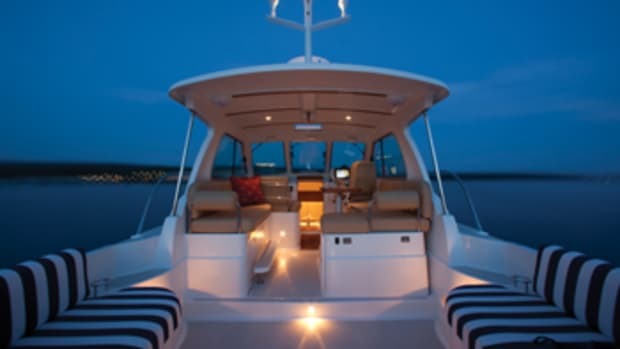 All the way aft is a tailgate-style transom that flips down to improve water accessibility. Fontaine says the three-cabin layout will likely be the most popular. Buffett chose to have an L-shaped navigation station/mini galley in the main saloon with a long berth across from it, a simple V-berth with twin bunks forward and a divided head/shower/utility space tucked between the V-berth and main saloon. 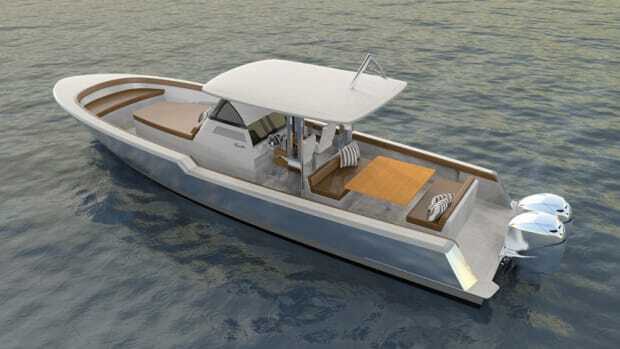 Rambler Yacht Co. will launch its first boat, the Rambler 38. It’s a center console designed by Sparkman & Stephens and built at the Lyman-Morse yard in Thomaston, Maine. 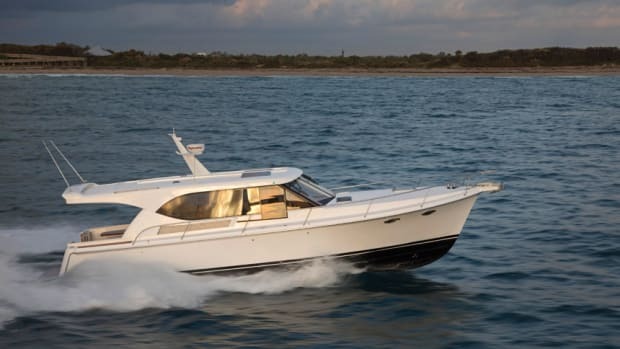 Hylas Yachts has launched the M44, the builder’s first foray into the U.S. powerboat market, with construction by Salthouse Boatbuilders in New Zealand. 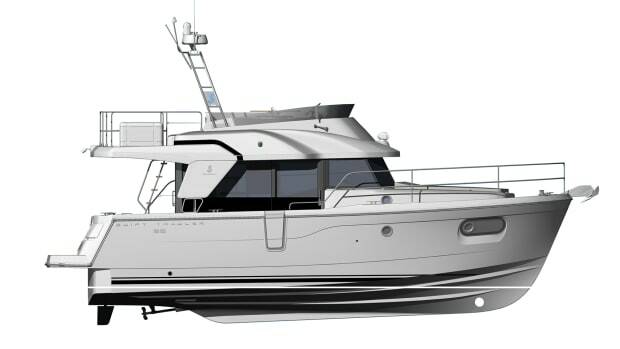 Beneteau is introducing the Swift Trawler 35, new from the keel up, as a replacement for the Swift Trawler 34. 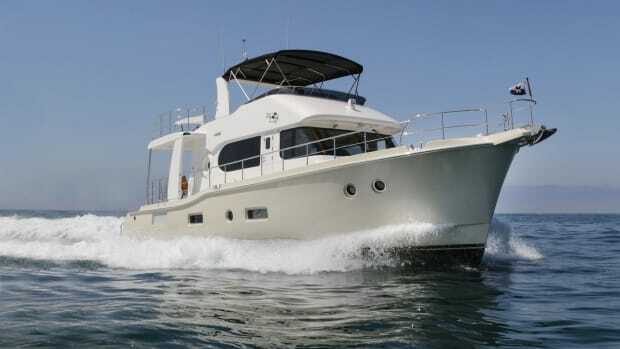 The 35 is expected to debut at the United States Powerboat Show in Annapolis, Maryland, in October. It’s a common dream among cruising boaters: packing up and slipping the dock lines to explore the vast waters that make up more than 70 percent of our planet. 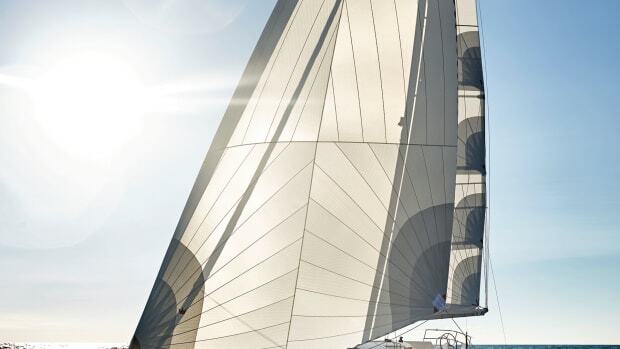 New sailboats at this year’s shows are engineered for ocean voyaging, daysailing, gunkholing and everything in between.